Being James Bond would be pretty awesome, right? Driving around Aston Martins... shooting really cool guns... throwing proximity mines all over the bathroom in Facility... Well, thanks to Machine Guns Vegas, you can now actually do almost all of those things with The 007 Experience. Drive Like Bond: The day starts when they show up at the front door of your hotel with a 420HP Aston Martin Vantage, which's all yours for the next 24hrs. And while it may not have rearward spraying jets like the one in Thunderball, it does have an iPod dock. 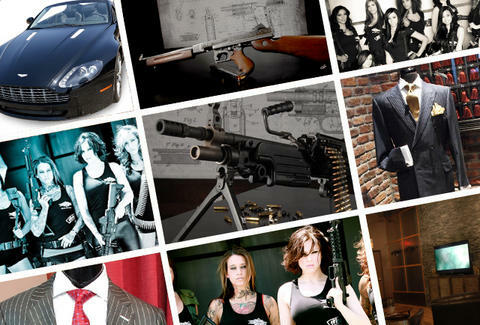 Shoot Like Bond: Next you'll hit a reserved VIP lounge at Machine Guns Vegas, where you'll have your own private shooting lane and 270 rounds for guns like a SIG P226, an MP5, an M60, an Uzi, and a Sup. 22, plus MGV's beautiful, Bond girl-esque female instructors who'll ensure you'll have one extra round in the chamber for later. Scotch Like Bond: From there you'll head over to Stitched Life at the Cosmopolitan, and partake in a one-on-one style consultation and Scotch tasting while they put the finishing touches on a custom-tailored suit complete with a Chadburry shirt, bow tie, pocket square, belt, socks, and Allen Edmonds shoes -- pretty much guaranteeing all the girls'll start GoldenEye-ing you.